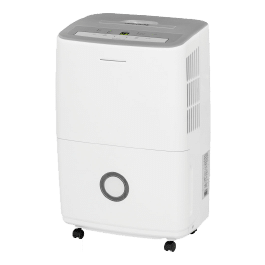 When it comes to the top rated dehumidifiers that the market has to offer, then the product range by Frigidaire is sure to be in the list- and the Frigidaire FAD504DWD is no exception. The Frigidaire FAD504DWD Energy Star is a great dehumidifier that offers a quiet operation along with a host of other features. 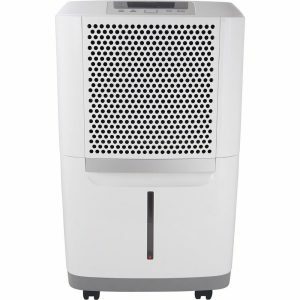 With a 16-pint tank size along with frost control, automatic restarting, digital display and a host of other advantages, there is little that this dehumidifier seems to lack. It can remove up to 50 pint a day, which again makes it amongst the best dehumidifier in this class. However-, such a short feature roundup is not enough, and before making a choice of whether to go along with the Frigidaire FAD504DWD Energy Star or not, it is important to review all that it offers as well as what all it lacks. Let us now go ahead and see what the ratings and reviews for this dehumidifier have to say, and where does it lack amongst all those things. 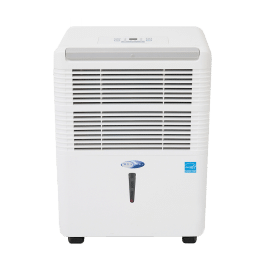 One of the best things about this model that sets it apart from the other dehumidifiers for sale is the excellent construction and build-quality it offers. It has a weight of 37 pounds, and despite of this and its size, the unit is very easy to move with the handles that have been provided on it. It also comes with caster wheels that further make portability easier- which means lesser effort in moving it to the desired room. Some of the key features of the Frigidaire FAD504DWD Energy Star that are worth mentioning in this review are highlighted ahead. 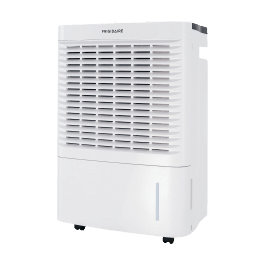 The Frigidaire FAD504DWD dehumidifier is a great way to remove any bacteria in the room, prevent mold and purify the air to make the environment healthier. With all of that, it is an energy efficient unit certified by Energy Star®. The unit can be set at exactly the humidity level that you want with the Effortless™ Humidity Control. All of the electronic controls that it has allow you to set the dehumidifier exactly the way you want it to operate. The unit also has a Full Tank Alert System. With this, when the water tank is close to the capacity, it will alert you so that you can go ahead and empty the bucket. In order to aid in portability, the Spacewise® portable design comes with top & side handles as well as caster wheels- so that you do not have to drag it from room to room with difficulty. The Frigidaire 50-pint dehumidifier uses the gravity drain port. Similar to standard models, the drainage port on this dehumidifier is located at the back of the unit. A gravity drain hose is required along with the unit, which has to be purchased separately. For a continuous operation, it is required that the unit be placed near a suitable drain. Connecting the gravity drain is also easy- all that the user needs to do is unscrew the cap at its back, screw a section of the hose and it is done! Let us now review the advantages that the Frigidaire FAD504DWD Energy Star come with that make it the best dehumidifier for basement and the rest of the house. The biggest advantage that this model can offer is its ease of use. 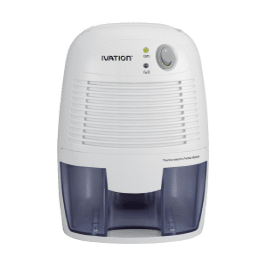 It has precise controls, easily configurable options, a high degree of portability and simple maintenance tasks that make it one of the best humidifiers in terms of setting up and using. If you are looking for a humidifier that can be used continuously, then this is the one to go in for. All that is required is placing the dehumidifier near a suitable drain. It will also alert you once the tank is nearing the full-level, prompting you to change it. The dehumidifier comes with a series of electronic controls along with a digital readout for humidity. This allows you to set it at the desired level and adjust other settings including the fan speed as per your requirement. It also comes with 2 different fan speeds that you can adjust as per your requirements and convenience. The Frigidaire FAD504DWD has an air filter that helps in filtering the bacteria, air-borne pollutants and all other harmful components from it. The dehumidifier has a 6-feet long power cord that allows you to use it wherever you want to. The Energy Star® rating is a sign that the dehumidifier uses less power than other units. Along with that, it also dehumidifies much faster which means lesser energy consumption while doing equal amount of work. 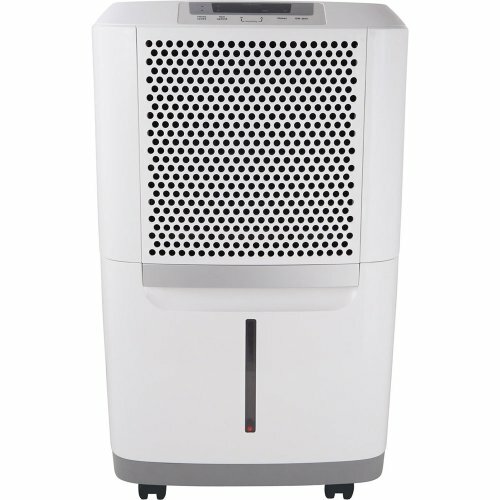 The dehumidifier creates minimal noise when in use. Even on high fan speeds, it will be very quiet with a maximum noise level of 53 dB. While there are a number of advantages of having the Frigidaire FAD504DWD Energy Star, that is not all we will talk about in this review. Here are a few disadvantages of having this dehumidifier as gathered from various customer reviews. One of the biggest disadvantages of this unit is that it cannot be used along with an extension cord. Despite of the 6 feet cord length, there are times when a longer cord may be needed but that is not possible. As per the tests run on the unit, the moisture removal rate in it is less than average. This, coupled together with the below-par accuracy of the hygrometer can be a little inconvenient. While the unit may be Energy Star certified, it is not the best in class, and there are other models that consume less energy. As mentioned above in this review, one of the biggest strong points of the Frigidaire FAD504DWD Energy Star is how easy it is to use this unit. The electronic controls allow you to adjust the settings as per your needs, while the digital display helps in keeping track of the precise humidity level. This is coupled together with automatic shut off, alerts when the tank is nearing full capacity and a lot more that make the Frigidaire FAD504DWD an easy to use and maintain unit. From the portability point of view, the user has another advantage since the unit comes with wheels and side & top handles that make moving and transporting it around an effortless and simple task. As the name suggests, the Frigidaire FAD504DWD comes with the Energy Star™ that is a sign of the high degree of energy efficiency that this unit comes with. As measured by various tests, this unit draws around 462 watts of power when operating in conditions with a 50% humidity level. However, it is to be noted here that it is not the best in class, and there are dehumidifiers with better energy ratings and efficiency. 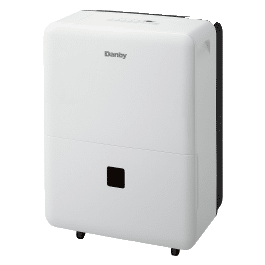 The entire dehumidifier appliance is covered by a 1-year limited warranty, provided that the unit is installed and used as per the given instructions. Along with that, there is a limited warranty from the 2nd to 5th year of purchase on the sealed system. This sealed system includes the compressor, evaporator, tubing and the condenser. Thus, weighing all the pros and cons of the Frigidaire FAD504DWD Energy Starmentioned in this review along with its modest price, it can be safely said that this is a model that will be worth the money you buy. A highly functional dehumidifier, it has a lot to offer to every user. With easy usage and setup, even the most novice of homeowners can make use of all that it has to offer. While it may not be the most energy efficient dehumidifier, it still is worth the money. This review should have helped you know all that you need for making an informed choice regarding this dehumidifier by Frigidaire! Q: Is the unit as noiseless as claimed? A: There is some noise associated with a dehumidifier, and this cannot be avoided. When the collection tank in it is empty, the drawer will vibrate and create excessive noise until it stabilizes with the collected water. However, besides that, this is the quietest model out there. Q: How can continuous drainage be setup? A: For setting a continuous drainage, all that is required is unscrewing the cap on its back and then attaching a part of the garden hose to enable the gravity drain. The hose can also be screwed easily without too much hassle. Q: Does it restart after a power outage? A: The unit will automatically restart from where it was left off after restoration in case of a power outage. Since these two models are essentially the same as far as included features and functionality is concerned, we ll only briefly cover the 50 pint s included features in this review.